The unexpected downpours over the last few days have slowed our progress down a little and we have been busy organising and installing tarps. 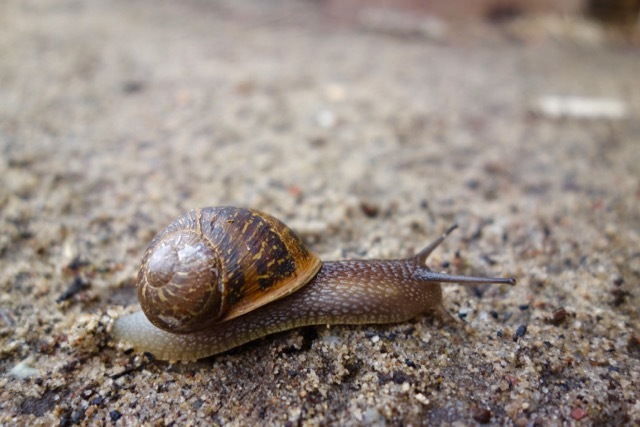 We were a little worried about our subfloor, as we didn't choose a marine-grade type ply. So we decided to "stay and defend" during the bad weather, which meant quite a bit of mopping. We still managed to build the framing for our bay windows and to install most rafters last week, as well as building our scaffolding. We will be back on site on Wednesday. Until then we will need to figure out some more details regarding our building envelope. 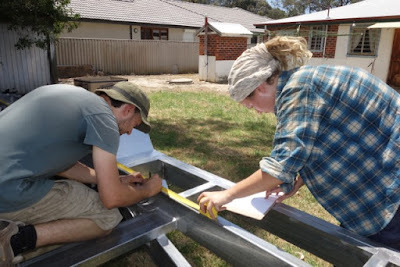 We still haven't decided whether to put our bracing on the inside or the outside of our timber frame. 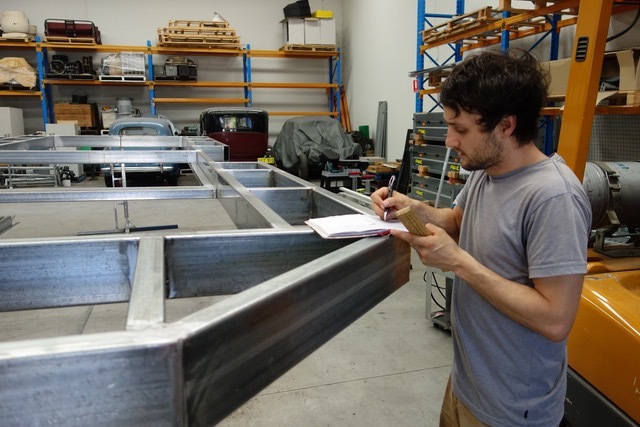 Easy accessibility to install plumbing, wiring and installation if putting it on the outside vs. increased airtightness and reduced potential condensation issues with the bracing ply on the inside... we keep going backwards and forwards between the two options. Here are some pictures that sum up the last week pretty well. These will be our bay windows! 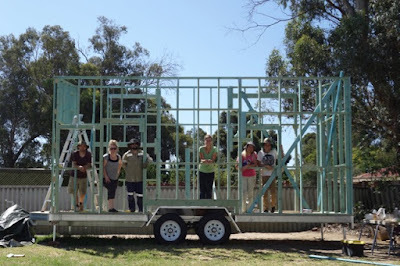 Today was a massive day - we've raised our walls! Whoop whoop! We've finally made the step from 2D to 3D and the tiny house is starting to feel pretty real now! Check out this timelapse of (almost) the whole framing process, including insulating the subfloor with sheep wool. more or less level and square with combined brain and muscle power. Even a broken wrist didn't stop Selene from helping us! We've spent the last week framing our walls and it's been a huge learning curve. 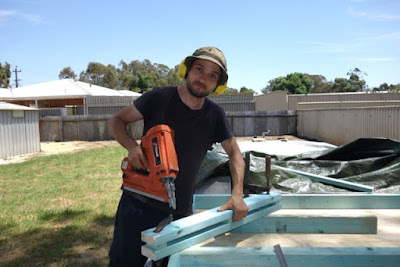 The second-hand nail gun made things a lot easier than nailing frames together by hand. got rained on straight away. We've bought a second-hand framing gun and it's the bomb! Our first two frames still felt a little wobbly after adding the noggins. 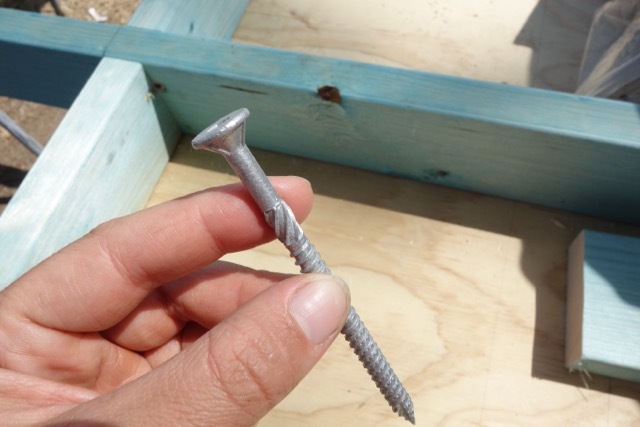 A builder at a little local hardware shop recommended the type 17 bugle batten screws. We've become a huge fan of them!! They improved the integrity of our frames significantly, so we went on by pinning the frames together with the nail gun and then adding some bugle screws. 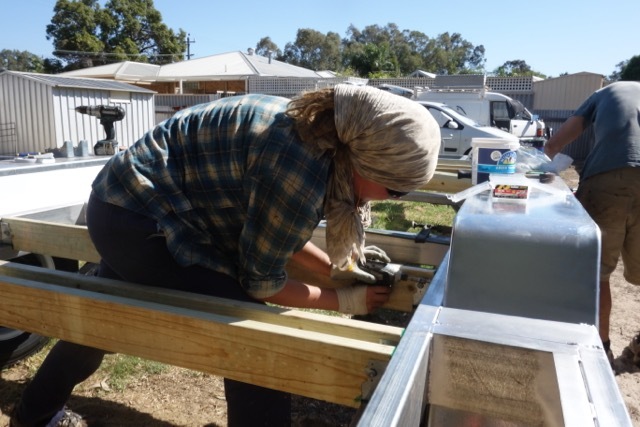 We also used double sided stud ties on some of the studs to account for uplift forces that our tiny house might experience. 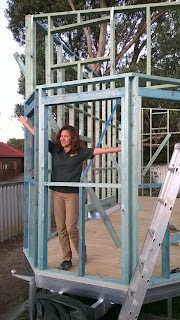 After all, we are building our tiny house to (hopefully!) 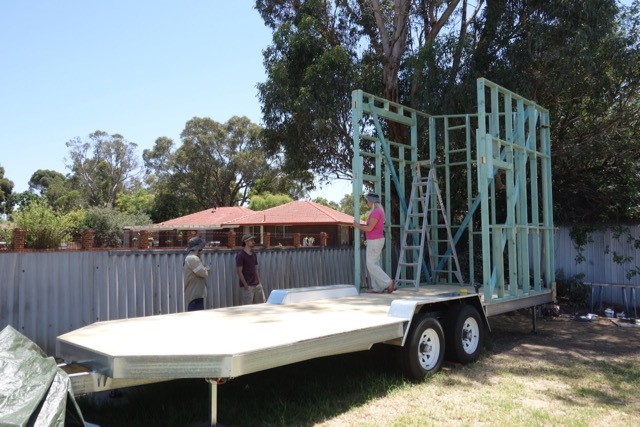 withstand high wind loads and earth-quake like conditions during moving. 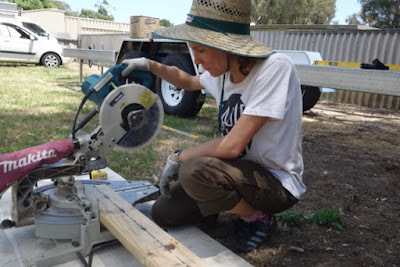 Tabea is turning into a badass carpenter! 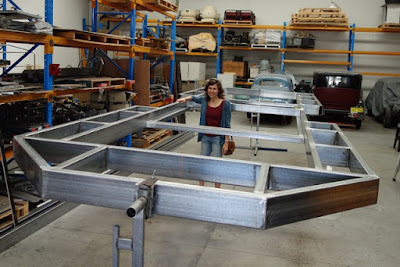 Next, we will be putting the frames together and raising the walls! 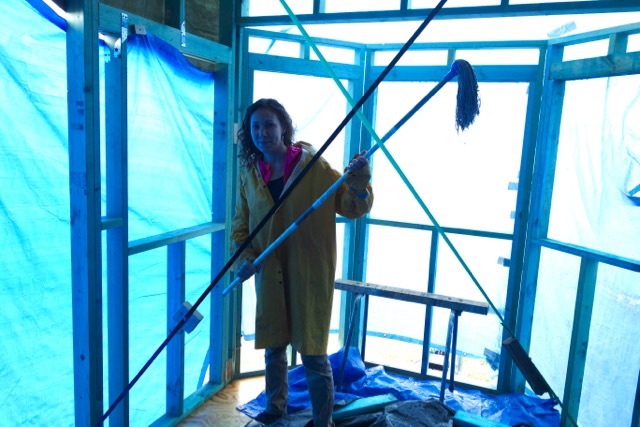 The subfloor is finished and we thought we'd let you know how we went about it. We installed 120x35 H3 pine joists to support our floor and attached these with joist hangers directly to the trailer. We could have had steel joists welded in when we had the trailer made, but we wanted to reduce both costs as well as thermal bridges as far as we could, so opted for the timber joists for additional support. 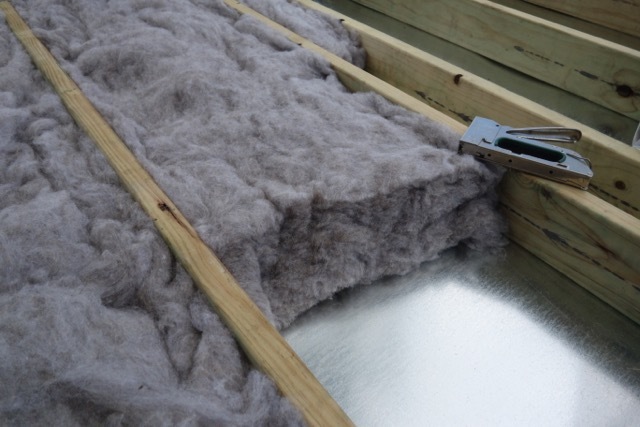 We then attached 0.4mm galvanised sheets to support our insulation batts. 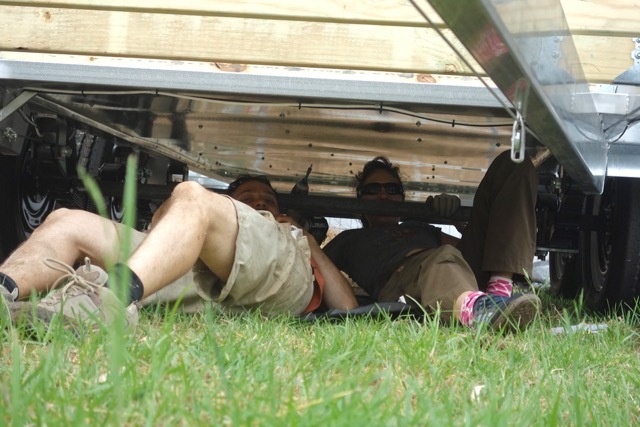 Even though it was extremely awkward, we decided to install the sheets from underneath. This way we can access the subfloor from the outside, if we ever needed to for maintenance. The 0.4mm sheets were the thinnest we could get and while they do feel a bit wobbly, they are sturdy enough to do what we need them to. Working with the galvanised sheets was unpleasant and noisy and we're glad that we picked timber and not metal as our main building material! We painted the plywood that we used for the subfloor with a borax solution before installing it. 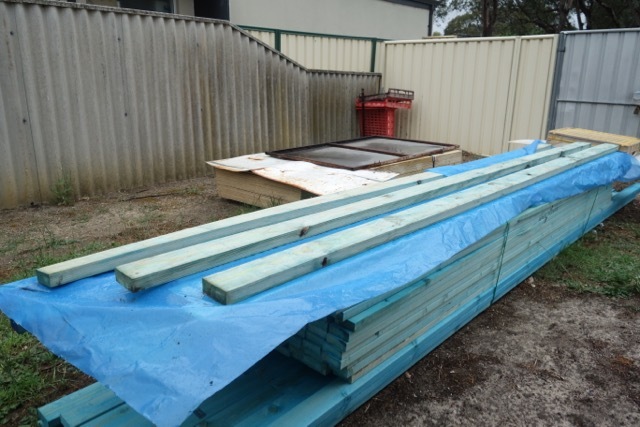 We read that this would deter termites, but hopefully they shouldn't find their way into our subfloor anyway, as everything below will be sealed and out of metal and H3 (external-grade) timber. 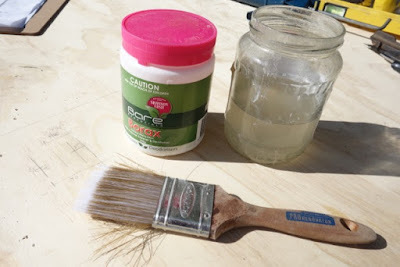 We're also not sure how effective the borax solution would be long-term, but we had it sitting in the cupboard anyway and it's a natural product, so we thought we'd just do it. 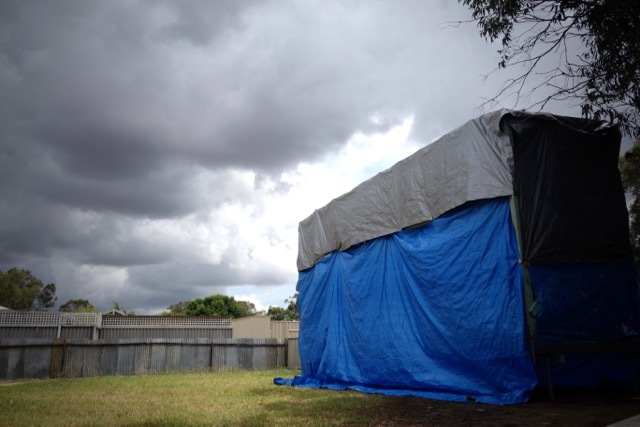 Luckily, the termites here are not as aggressive as up north, so we should be fine as long as we regularly check around and underneath the trailer. Fingers crossed. 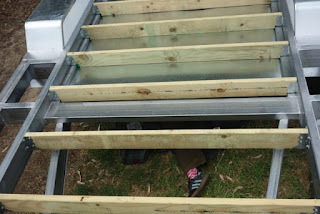 On the photos you might have noticed that our joists are not evenly spaced. This is because we needed extra support in spots where we'll be putting braces and and an internal wall. Other joists had to placed where the standard-sized plywood sheets for our subfloor would meet, so at just under 1.2m apart. We left 2mm gaps between the plywood sheets to allow for expansion. 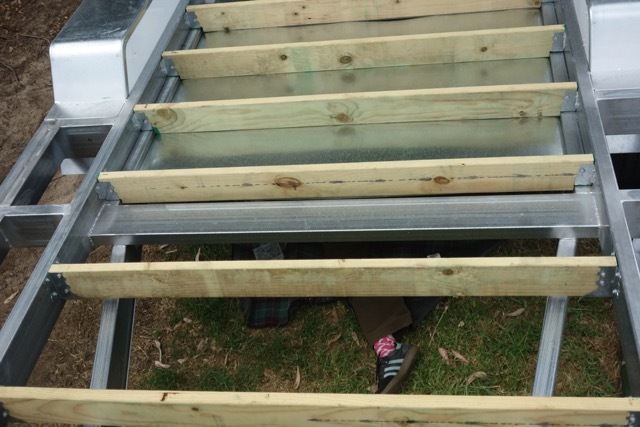 In hindsight, we should have added those 2mm to the 1.2m joist spacing. 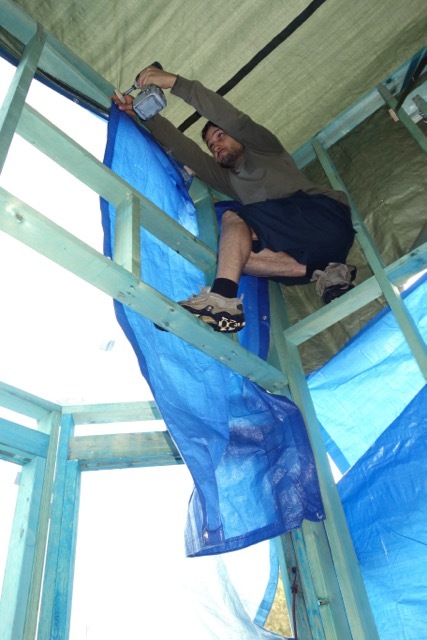 We then sealed those expansion gaps with caulk, both to increase airtightness at a later stage and because we were worried about rain or bugs getting into the subfloor insulation during construction. Now that the subfloor is finished, we have a clean slate to build our tiny house on! 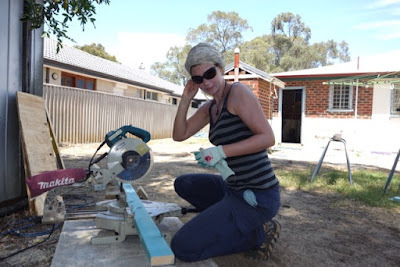 Cutting the plywood to size. We finally started our build yesterday. What a day! 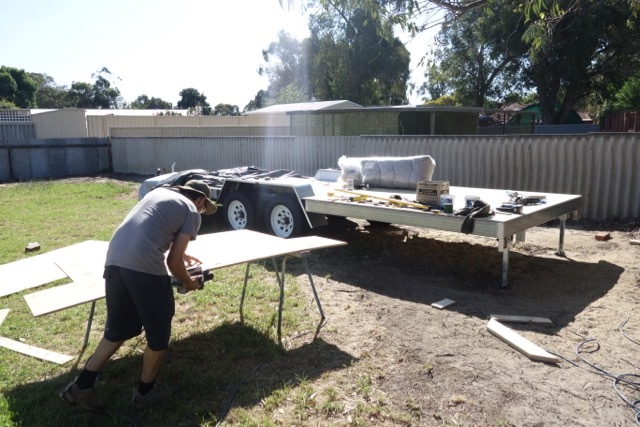 Temperatures reached 38°C (100° F) for the first time this summer and from about lunchtime the trailer was too hot to touch without gloves. A special thanks goes to our dear friend Tabea for giving us a hand! By the end of the day we were a little worn out from both the excitement and heat but that didn't stop us having a little celebration to mark Day 1 once we got home. Things may have gotten slightly out of hand which led us to skipping today's plans. Instead we stocked up on more hardware and a big water jug to keep us hydrated. Anyway, Tuesday we should be back at work receiving our timber delivery, which will give us plenty to do for the unforeseeable future! Izzy getting ready for the very first cut! Happy and exhausted after our first day on site! Our trailer arrived today! Hooray! It all went surprisingly smoothly and the trailer is so well balanced that we can still manoeuvre it by hand, if we put some weight on the back. We are really happy with the way the trailer turned out. Our trailer builder did an amazing job and everything from the welds to lights, breakaway device and wheels looks fantastic! We'll clean up the site a bit more tomorrow, get it into the right spot, level it, and we will be ready to go. Exciting times ahead! had to be moved to make way for the trailer. but we'll appreciate every inch of shade we can get over the next few months. We had a call from our trailer manufacturer today and they will deliver our trailer later this week - things are getting serious! Nice and easy. 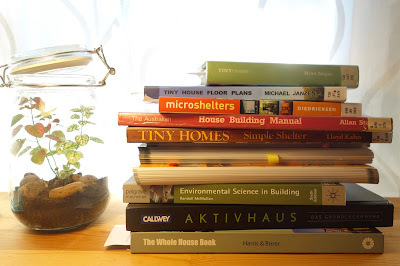 As seen on many Tiny House blogs. The only problem is building science. 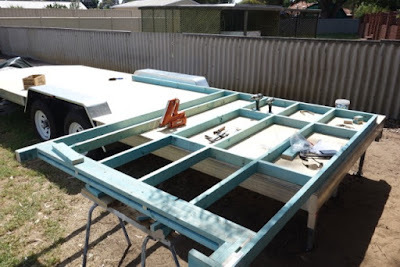 Once you start reading about vapour retarders and air barriers it becomes apparent that there could potentially be moisture problems in a small space with an inherently air-leaky surface such as T&G boards and with having the most vapour impermeable surface, the plywood, on the outside of the building. 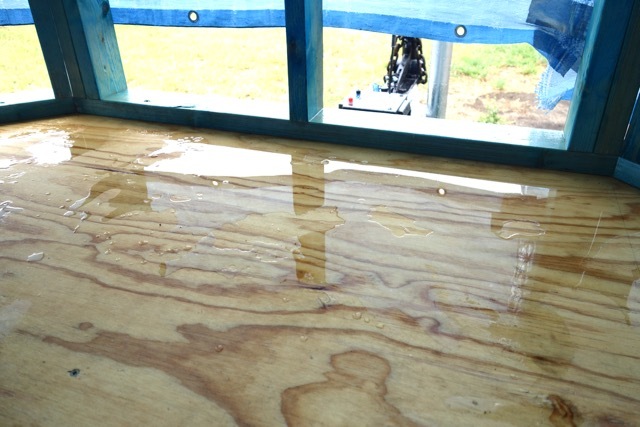 Could there be a situation in winter, where moist air from the inside saturates our plywood by condensation (adsorption)? A dew point could possibly form on its surface when temperatures outside are a lot colder than inside. Are we overthinking this? 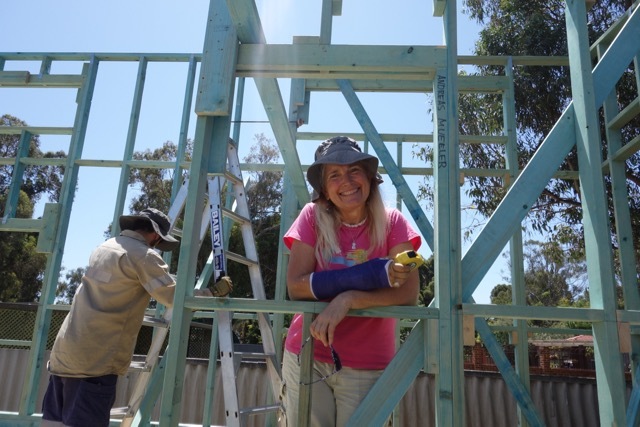 Is Perth's climate forgiving enough not to have to worry about vapour retarders and airtightness? 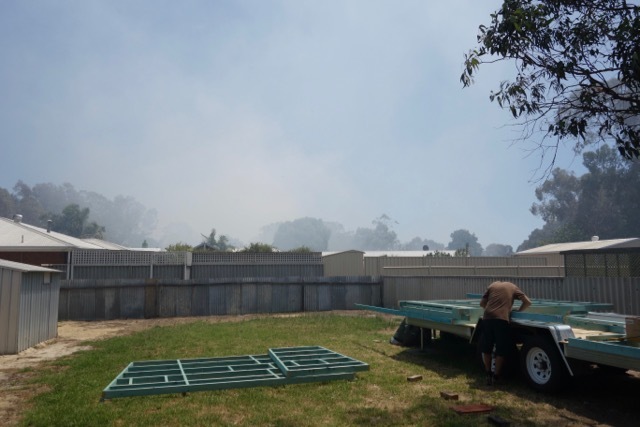 Will we even live in Perth with this house for the longest time, because Albany's climate, for example, could pose different challenges on the house? First of all, reading up on this issue made us aware that air transported moisture is supposedly a much greater concern than diffusion through wall materials. The sheer volume of water penetrating into wall cavities in a normal house by air leaks compared to vapour diffusion is apparently massively larger. Secondly, reading up on websites like buildingscience.com and, especially helpful, greenbuildingadvisor.com made us a little less nervous about the need for vapour "barriers" in this part of the world, but certainly increased the concern for airtightness of our walls. We like our walls to breathe in the sense that we like our walls to be able to dry out before they start to rot. 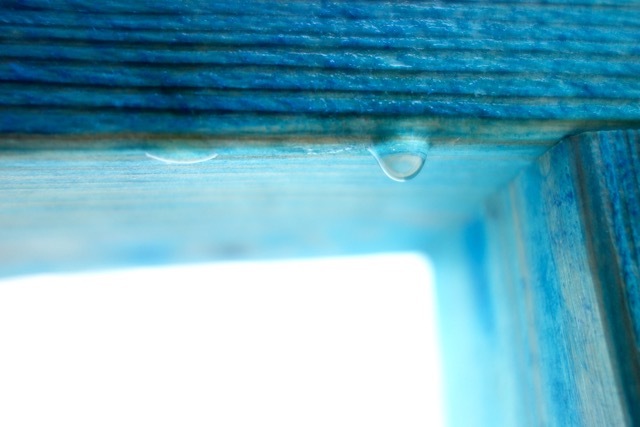 Unintended air leaks however are not so great, as they not only increase energy needs for cooling and heating in a tiny house with little thermal mass, but also introduce moisture related problems. 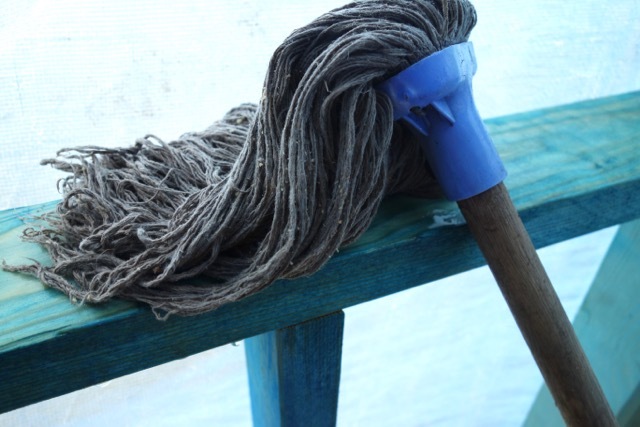 If you have a leaky house, as is the case with many older, traditional houses, moisture can easily move through the walls via cracks in walls and gaps around windows and doors, electricity plugs, light switches - you name it! The house we currently live in is so leaky that you can feel an actual draft in winter and it gets ridiculously cold, considering winters aren't even that harsh here in Perth. Then again, those old houses get crazy hot in summer! 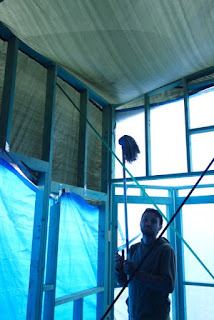 What we are after is definitely not a vapour barrier (think living in a plastic bag) but to allow for vapour permeability on the inside and outside of our wall. As most of the steam and moisture that could potentially enter the walls will be created on the inside of the building (cooking, showering, breathing,...), we want to achieve a fairly high level of airtightness on the inside of our walls, to stop this moisture getting into our walls in the first place. We will try to relax and not worry too much about diffusion through wall materials and we'll just rely on the moisture-transporting properties of our timber and housewrap. How are we achieving this? Well, we really wish you could tell us! As we can't use the tried and tested drywall in our build as a vapour permeable air barrier, we are currently considering options like using a modern smart vapour retarder and airtight layer (Intello Plus or similar) on the inside behind our wall lining or just plain old thin plywood, which is fairly air tight (if meticulously installed!) and has smart vapour retarding properties as well. Another option we have seen would be to put the outside plywood sheathing onto the inside, which could address a lot of our concerns. However, we are both not really comfortable with relying on house wrap alone for protecting our walls from the elements, without having some sort of plywood behind it as a "back up" in case any rain does find its way behind the cladding and through a puncture or leaky seal in the housewrap. We will share our new wall layout later, once we are sure about it. 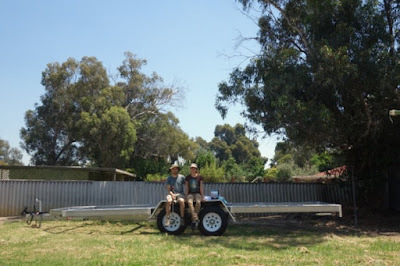 Hopefully that will be soon, as we are expecting our trailer and first timber within the next week! AAH! This detail shows the outermost steel beam and the subfloor and wall on top of it. 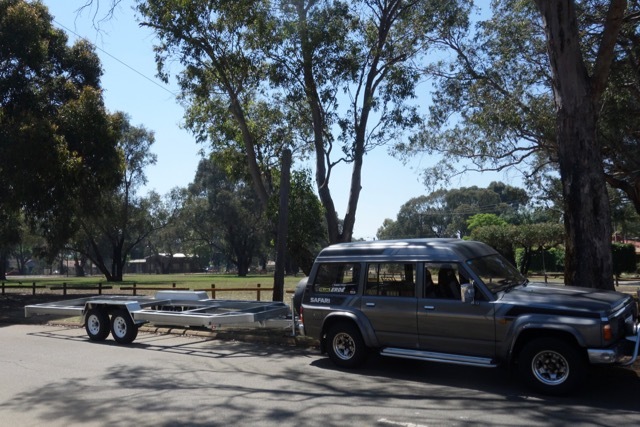 The difference to our trailer is that the steel angle is welded onto the outside instead of the inside. The revised detail would allow for easy access to bolts, even after the whole floor has been insulated. 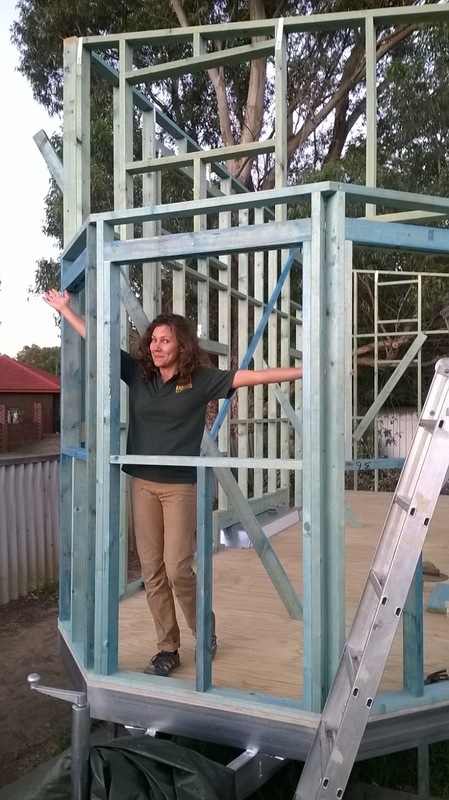 Let us know what you think about airtightness and vapour barriers/retarders in tiny homes - any experience or advice will be much appreciated! 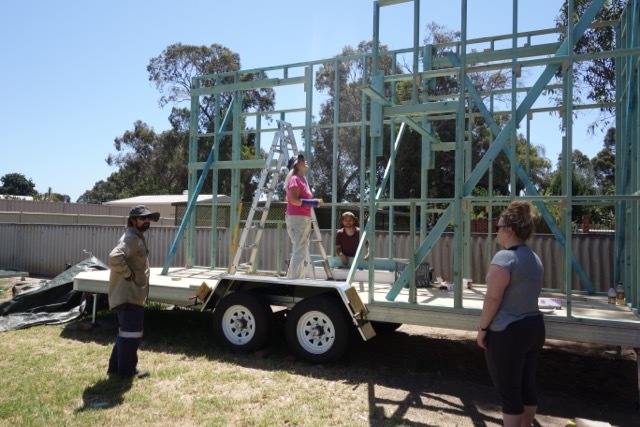 Today we had a first peek at our soon-to-be trailer. It looked huuuge! Maybe it just seemed big because it was raised off the floor, but I feel that we can hardly call it a "tiny" house on wheels. More like small-ish house on wheels. 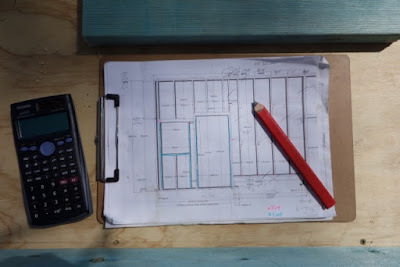 Now that we have the measurements we can start planning our subfloor. We first thought we'd space our suspended timber joist evenly (in line with spanning tables to support our floor), but then it occurred to us that we will need to put joists in particular places to support some bracing elements we have just added. Here are a couple of pics! home we weren't quite sure anymore what measurements they were. Oh dear. First cuddles with the trailer! 5) we increased the sheet-braced area above the bay-view window and decided to use thicker material to sheet-brace the two smaller walls. 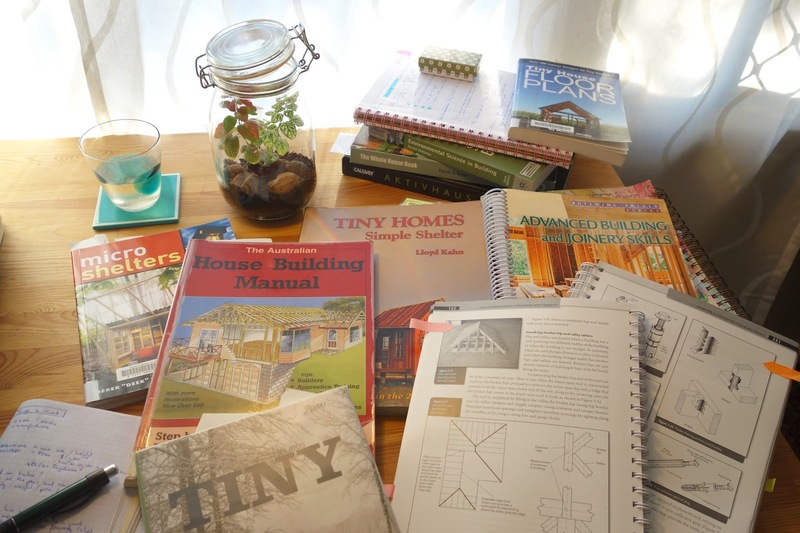 ... and thanks to everyone in the "Tiny House People" facebook group and also to our friend Robert for your suggestions and inspirations! Please comment if you have any advice for us ! At the moment it's lots and lots and loooots of background reading for us. Thank goodness for inter-library loans. Even our librarians are getting excited about the tiny house project now! "Tiny Homes Simple Shelter" by Lloyd Kahn is my favourite coffee-table book out of the lot. So many projects to explore in there, and quite often he provides the websites or contacts from the original builders. "Tiny House Floor Plans" by Michael Janzen was a little disappointing to be honest. I had seen it advertised quite a lot on other tiny house blogs but for me it was of little help. Lots of floor plans in there obviously, though no innovative ideas, no comments on the pros and cons of those floor plans and no measurements provided. It looked like he just had a play with an interior design app. "The Australian House Building Manual" by Allan Stains provides a great general overview of building and framing and will come in handy I think. We might buy the latest edition, as the library one seems a little old. Another document we have been finding quite useful is - surprise, surprise - the Australian Timber Framing Standard (AS 1684). 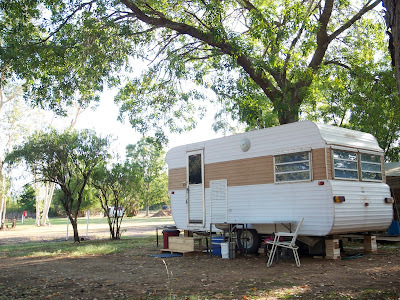 Though some of the information may not apply to tiny houses, it got us thinking about what wind loads our home will need to withstand when towing it and how to brace it and tie it down accordingly. So far we've settled on something between level N2 and N3, which corresponds to building safely for windspeeds between 120 and 180 kph. We'll keep you posted on more resources that we come across. Feel free to add any that you have found helpful, interesting or inspiring in the comments! There is a massive backyard and a decent size workshop in our current share house. 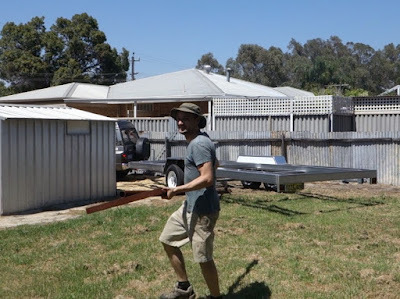 However, we can't build our tiny house on wheels in our backyard, as the house we live in was built stupidly close to the neighbouring properties. Well... we could, but we wouldn't be able to get it out once finished. So we had to start looking for a place to build. We circulated some ads looking for land via emails, facebook, flyers and local noticeboards. The amount of positive feedback and offers for both help and land we received from friends and strangers left us completely humbled. 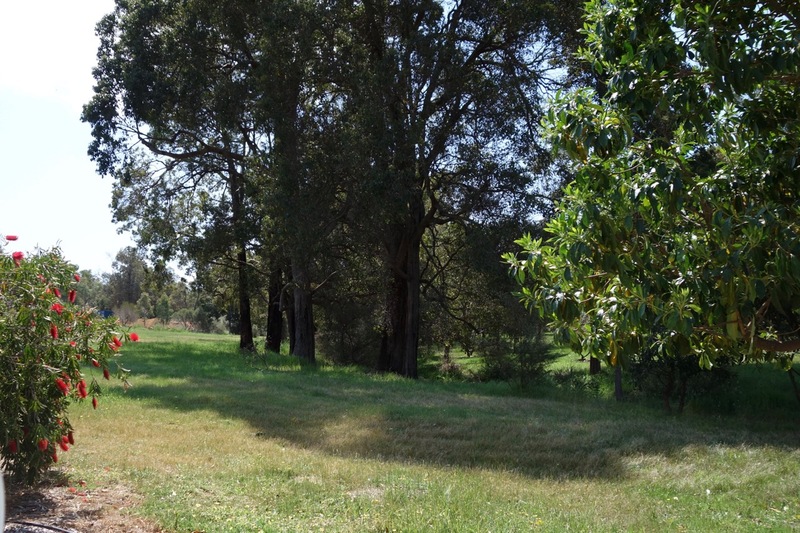 We thought it would be near impossible to find a place, but after a couple of weeks we had a good handful of offers. Faith in humanity restored! "Just build it here, I'll show you, it's perfect!" After much umming and aaahing we decided to accept her offer, as the shop is a) the place closest to us and b) they have an industrial licence which means we can make some noise. It was one of the hardest decisions we ever had to make, as everyone we visited to look at their land was so generous and genuinely wanted to help us. 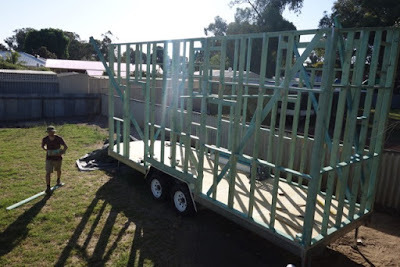 We thought it would take months and months to find a place and all of a sudden so many people were interested in our tiny house project and we didn't even have a plan for our tiny house yet. Better get started! 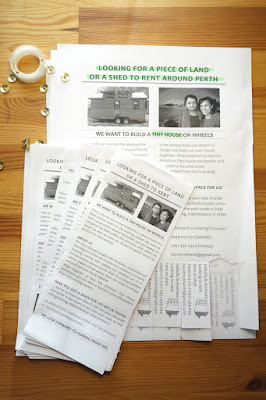 We first fell in love with the idea of a tiny home on wheels in 2008, when we bought our first van after arriving in New Zealand. We fitted it out and travelled the country in it for nearly a year. 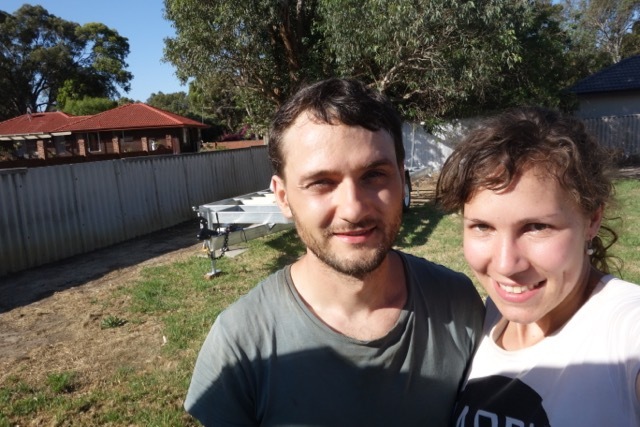 The original plan was to return home to Germany after that, however we had both caught the travel bug and found ourselves living in Australia in a very similar van only a few weeks later. He was our steady companion for a good couple of years. In 2008 it turned out that we were going to stay put for a few years, so we decided to treat ourselves and refurbished an old caravan, which was our humble abode for the next couple of years in the East Kimberley. crowded during tourist season though! 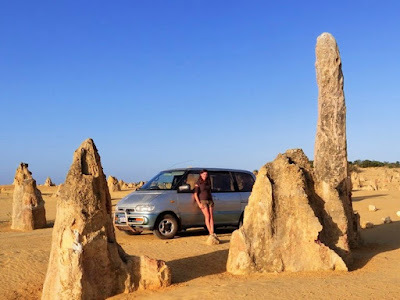 When it was time to move on again, we travelled down the coast of Western Australia in the "Silver Bullet". It felt like we were selling our soul when we traded it in for a fuel-efficient little city car once we got to Perth.